The Indiana Chamber supports the construction of the Keystone XL Pipeline as a means to reduce our national dependence on unstable governments, improve our national security, strengthen ties with an important ally and promote the production of Canadian oil. Based on a recent ABC News/Washington Post Poll, most of the country agrees. Indiana and our country are deeply dependent on foreign oil sources from countries that are typically not our friends. Canada has vast oil reserves and is presently our number one supplier of oil. It is critical that we continue to have a positive relationship with Canada by supporting their oil production and the pipeline that will carry this crude. Many Indiana companies supply various products and materials that will be used to refine this oil and move it through the pipeline. • NASA needed four years, from 1979 to 1983, to build the Space Shuttle Discovery. • As OilSandsFactCheck.org outlines in an excellent infographic, it took just two years (1941 to 1943) to build the Pentagon — the world’s largest office building, and home to 30,000 military and civilian employees. • The Golden Gate Bridge linked San Francisco and Marin County, Calif., after just four years and four months of work over one of America’s most unforgiving waterways. Construction began on January 5, 1933. Pedestrians first crossed the bridge on May 27, 1937; cars followed the next day. • Hoover Dam required five years of construction (1931 to 1936). It was finished two years ahead of schedule. • It took one year, three months, and nine days to erect the Empire State Building. Between January 22, 1930, and May 1, 1931, a force of 3,439 men built what became — at 1,454 feet — Earth’s tallest skyscraper. Obama’s endless “study” of Keystone is disgraceful. If he believes it should be built, he should approve it. 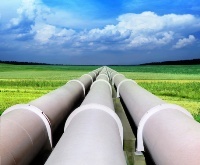 TransCanada will invest $5.3 billion to build the pipeline. Taxpayer cost: $0.00. While some 10.2 million Americans officially are out of work, KXL will offer direct or indirect employment to an estimated 42,100 people. Beyond the unemployed, all 315 million Americans would enjoy the steady flow of friendly oil from a NATO military ally. Every petrodollar exported to Canada is one less dollar shipped to overseas oil producers — such as terrorist-funding Saudi Arabia, gay-jailing Nigeria, and the Crimea-invading Russian Federation. This entry was posted in Energy, Environment, Government and tagged canada, Energy, keystone xl, Mitch McConnell, north america, oil, pipeline by Indiana Chamber of Commerce. Bookmark the permalink.